The first step in the Christian journey of faith is ordinarily baptism. But for new believers in India – The Lutheran Church-Missouri Synod’s oldest mission field – cultural barriers might mean that converts go months, even years before being baptized. In fact, Rev. 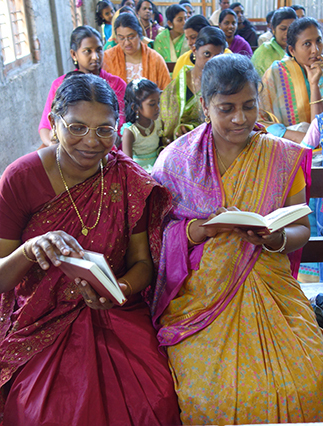 Samuel Thompson, pastor and seminary professor in the India Evangelical Lutheran Church, believes there may be millions of “unbaptized believers” in India. “Indian society is marked with strong community and family ties,” Rev. Thompson explained. “Conversion to Christianity implies a self-removal from one’s social, family and cultural ties. Many of the converts find themselves being ostracized by their loved ones when they transition to a new faith. In recent years, another obstacle to Christianity in India has developed: the rise of Hindutva (meaning “Hinduness”), a political movement to establish India as an exclusively Hindu nation. Anti-conversion laws have now taken effect in five of India’s states, where Christian organizations like Compassion International (which provides assistance to India’s poorest children) have been expelled because their charitable works are interpreted as an “allurement” to become Christian. How can the Lutheran Church witness? Rev. Thompson has found that house visits and neighborhood gatherings in Christian homes to be places where new and searching believers can find support and have their questions answered as they walk the path to baptism. And now, due to a fresh reprinting by LHF of the Small Catechism, Malayalam-speaking Indians have another source for answers. As the 500th anniversary of the Reformation (and LHF’s 25th anniversary) approaches, Rev. Thompson said Luther’s Small Catechism is more relevant than ever. “The catechism helps new believers realize that what they learn isn’t some manmade story, but it is the real truth which comes from the Bible,” he said.